Real Madrid keeps crushing their opponents and once again, Cristiano Ronaldo was the MVP of the night against Getafe. 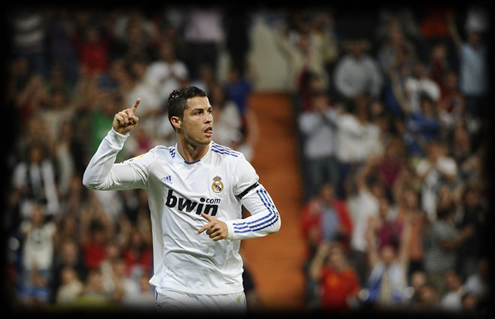 CR7 scored another hat-trick and now has 37 goals in the Spanish League "La Liga" and 50 goals in all competitions. Remarkable! In the1989/90 season, Real Madrid former player Hugo Sanchez matched Telmo Zarra’s record of 38 league goals in just one season. Many said it was a mark from a different era of football and that no one could get near to it. 21 years later, Cristiano Ronaldo is on the verge of doing just that, and even surpassing it. With his hat-trick against Getafe last night, CR7 now has 37 goals this season (or 36 depending on counting or not with the goal against Real Sociedad in La Liga's fixture #3), with matches against Villarreal and Almeria still to play. Tuesday’s match got off to a slow start for both sides, as a clear sign of the end of the season. Real Madrid were satisfied with creating plays and opportunities, while Cristiano Ronaldo put Getafe's goal in the center of his crosshairs. Following an extraordinary pass by Mesut Ozil around the 24th minute, Cristiano Ronaldo out-jumped Cata Diaz and connected with a perfect header to send the ball into the back of the net and make it 1-0. It was a heavy blow for Getafe, who were unable to advance towards Adan, who was replacing Iker Casillas tonight. This is most likely by far, one of the easiest matches of his career as Getafe ended the first half without any shot on goal. In the second half, Getafe pushed their lines forward, but to little avail. Real Madrid, in the meanwhile, tried to score a strike that would seal the win. Then on the 58th minute, Gonzalo Higuain beat Ustari to a ball and the deflection landed at the feet of Mesut Ozil. The German midfielder passed the ball to Cristiano Ronaldo, who dribbled by Cata Diaz and easily scored the tap-in. The strike sunk Getafe, but only made Real Madrid hungrier. Adebayor and Karim Benzema came off the bench around the 75th minute and the Frenchman needed all but a minute to make it 3-0, after a brilliant show of ball control and a great pass by Xabi Alonso. Castilla goalkeeper Tomas Mejias then made his first team debut, by stepping in for Adan, with still six minutes left to play. All that was missing was the icing on the cake. And it came on 91th minute, when Mane tackled Cristiano Ronaldo inside the box. CR7 wanted his hat-trick and had little trouble beating Ustari from the penalty spot, to close out the 4-0 win and celebrated the goal with Adebayor in style similar to the NBA celebrations. That makes 37 goals (or 36) for Cristiano Ronaldo, who is the frontrunner for top scorer in La Liga as well as the Golden Boot, leaving Lionel Messi and everyone else behind. Remember that you can watch Villarreal vs Real Madrid livestreams, for the Spanish League, online here on ronaldo7.net, this Sunday. Cristiano Ronaldo will most likely play on this match.